A major challenge in producing good quality pipe on a welded Pipe Mill is the build-up of slag on the ferrite bundle used inside the pipe. Slag is a mixture of metal oxides and silicon dioxide that is a byproduct of separating the steel from its raw ore. Ferrite bundles are typically placed inside the pipe to help concentrate the electrical radiation towards the seam to be welded. During welding, slag can drip down from the molten metal at the edges of parent material, building up deposits on the ferrite bundle casing surface inside the pipe. The result is a potential reduction in power concentration at the weld point, which could lead to weakened pipe welds. Known as a “Ferrite breakdown”, it needs to be identified early in the weld process in order to avoid poor welds from making their way down the line or out the door to the customer. One obvious solution would be to periodically stop the mill and open up the pipe and visually inspect the casing; this of course is not always a feasible or desirable solution. A better approach to identify changes over time is by monitoring the shape of the weld bead. This can be done by operators who might visually inspect the scarf coming off the tube for signs of change and or abnormalities. However, as slag could build up on the surface of the ferrite bundle casing which is inside the welded pipe, it is difficult for the operator to notice any slag buildup. A better solution would be to use a laser based profile measurement system such as the Xiris WI3000. 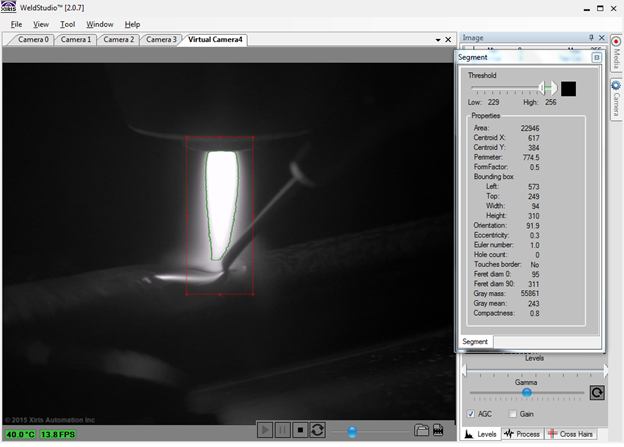 By using a precise laser with a high speed camera, multiple images of the weld bead and its immediate area can be taken. The shape of the weld bead can then be automatically analyzed for potential defects. If there is slag buildup on the surface of the ferrite casing and less power makes it to the seam of the pipe, the top of the weld bead may become flatter or even concave as a result of reduced weld power concentration. Visually it may appear to the operator as a “pasty” weld and we like to call it a “freeze line” defect. When monitoring the weld bead using a laser profile of the weld zone complemented with some real time geometrical measurements, the operator can be alerted to the freeze-line condition defect much sooner. As seen in the picture below taken from the screen of a WI3000, the operator is provided with a magnified view of the weld zone readily visible from afar. In this view the weld bead is starting to flatten and if it becomes concave, the operator would be alerted before a potential faulty weld is generated. 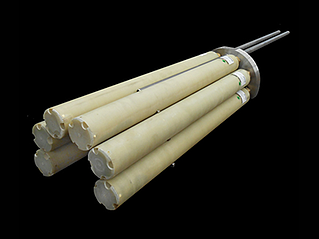 The shape of the weld bead on an ERW pipe mill can provide much information. In particular, if a laser based profile measurement tool is used, such as the WI3000 from Xiris, early detection of defects such as freeze line can be made. Such defects often occur as a result of a reduction of power making its way to the weld zone resulting in incomplete heating of the weld bead. By providing early warning of such defects, operators can correct the problem before it becomes a critical failure. Weld.com is a one of the welding industry’s fastest growing online resources. Their new weekly series entitled MIG Mondays aims to educate welders on all aspects of MIG welding. Weld.com approached Xiris Automation when they wanted to replace their existing weld camera with one of much higher quality and they were amazed by the clarity and precision of the XVC-1000. In order to understand exactly what is happening during the welding process, professional welders are embracing High Dynamic Range camera technology to see their processes in great detail. 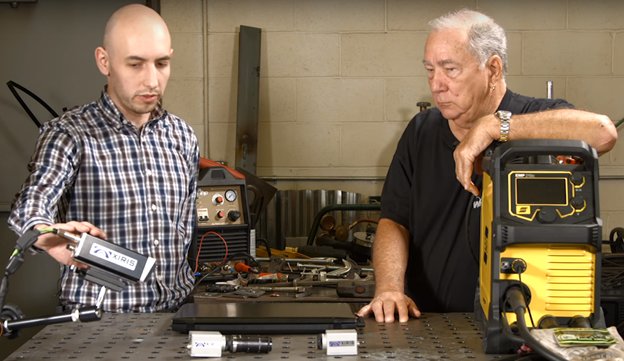 Visit Weld.com to see the latest episode of MIG Mondays, as Paul and Justin discuss the applications, benefits and more of the XVC-1000 series HDR cameras. Traditionally, cameras that have been used to record images of various welding processes are implemented with a free running image trigger. This means that images from the camera are acquired as fast as the camera can send them, and only when the camera can send them. However, with a digital Weld camera, such as the Xiris XVC-1000, images can be acquired from the camera when given the signal to do so via the image trigger. This creates an opportunity to tie the image acquisition to a specific event. 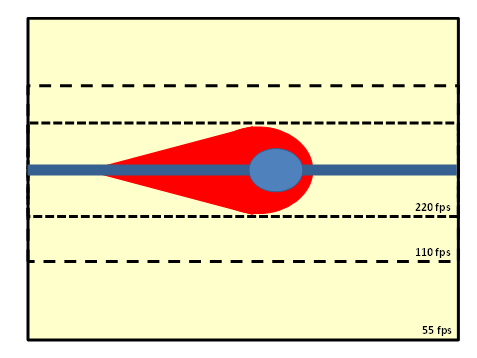 A typical example of such an event is during a laser weld cycle where the laser power may take several milliseconds to ramp up to full power or to form a keyhole and then, once at full power, may be pulsed to achieve a particular welding effect. In any of these situations, it can be interesting to acquire an image at a very specific point in time to see a specific feature. This can be done very precisely with the XVC-1000 using an external trigger signal generated during a specific event, such as the point when laser power peaks during a cycle. When combined with a programmable exposure time, images of very specific events, such as only during laser on during a pulsed laser application, can be acquired. In other types of welding, such as pulsed GTAW, a trigger could be sent at a particular point for each pulse, which when combined with a programmable delay and programmable exposure time, would allow image acquisition to take place at a very specific point in the weld cycle. The benefit is the ability to view the weld pool consistently during a high or low point in the weld cycle and monitoring how it would grow or shrink over time. Another benefit would be for wire fed welding, where the effect of the weld pulse on the wire position as it enters the weld pool could be monitored. In GMAW processes, the image trigger could be aligned with a specific voltage or current event during the wire contact/expulsion cycle. By acquiring an image at exactly the same point in the weld power cycle, it is possible to study how droplet formation and transfer rates change over time. Lastly, for alternating polarity welding applications, an image trigger signal could have great value in assisting the operator in setting up the weld torch and determining the ideal weld parameters for each polarity by triggering only on that portion of cycle when the power conditions are met. An example of a free-running video versus a triggered video. Note: the triggered image acquisition for this video was done at a slow rate, of about 2 Hz. 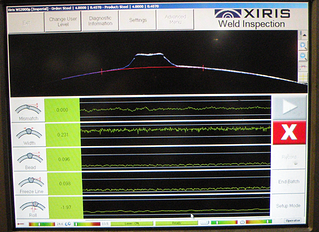 The use of a trigger signal can greatly improve the quality of images of most welding processes when using a camera such as the Xiris XVC-1000. By clamping the trigger to a specific power event, images can be acquired at a precise point in the weld cycle, allowing for better set up and diagnostics of the welding process. All digital cameras, including the Xiris XVC-1000 Weld Camera, have a digital output signal that is limited by the speed at which data can stream out of the camera. This limits the frame rate of the camera and is a function of the frame size of the camera. For the XVC-1000, the camera can output 55 frames per second at full resolution of 1280 x 1024 pixels. However, it is possible to create a faster frame rate by reducing the size of the image, or Area of Interest (AOI). For example, if the height of the AOI is cut to half the full frame image size, then the frame rate can run twice as fast, e.g. approximately 110 frames per second, or if cut to a quarter its height, the frame rate will be over 200 frames per second. If a very small window is made that could see a small weld process such as a laser spot and a thin weld, the frame rate could run up to 1000 frames per second. This can be very useful in certain situations where features of very short duration need to be monitored. As an example, many industrial laser welding processes have their laser powered ON for very short durations, usually far less than 2 seconds. This would require a higher speed imaging capability to see exactly what was happening on the weld. As the Area of Interest in a laser process is a long thin rectangular area – typically the weld spot, the seam and a narrow weld pool, reducing the AOI can sometimes be done on a laser process to good effect. The result is a high speed image capture that captures the detail of the laser spot and immediate area around it. A digital Weld Camera with Area of Interest capability can be used to image very small, narrow regions of interest at high speeds by reducing the Area of Interest of the camera. As such, Weld Cameras can be used as a valuable tool for set up and alignment of high speed laser processes. A major challenge that manufacturers face when integrating a weld camera to a laser weld process is the changing amount of reflected light that comes back to the camera. Huge swings in brightness of reflected light can cause challenges when trying to produce a good image, requiring a high dynamic range camera with the ability to change quickly to rapid brightness variations. 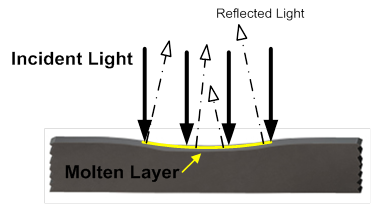 To explain this phenomenon, it is useful to look at how the incident laser light hits the substrate during a welding or cutting process and how the reflected light bounces back to the camera. 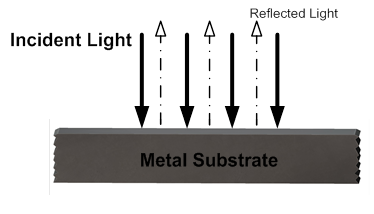 When the laser is first powered on, the substrate is typically flat and perpendicular to the rays of incident light of the laser as the surface has not been melted by the laser radiation at this point. As a result, a high amount of light from the laser gets reflected right back to the laser beam delivery optics and eventually to the camera, creating a momentary flash of intense brightness. This bright reflection could saturate and even damage some cameras. After a brief period, the laser starts to melt the surface of the substrate, creating a small concave molten layer. The reflected light going back into the laser beam delivery system reduces as there is a bit of focusing of the reflected light rays. 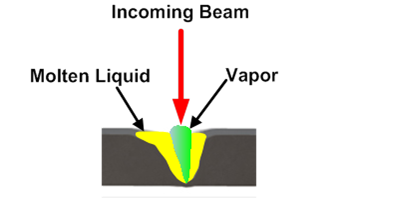 After a little more time, a deeper cavity is formed as the laser vaporizes some of the substrate material. At this point, the laser light is bouncing around the cavity and even less light makes its way back to the camera. The final stage is once a Keyhole is formed. This is a deep, narrow cavity in which the metal is melted, some of it vaporized and then it flows around the cavity and solidifies. At this point, the laser light hits the keyhole, bouncing all around the keyhole and most of it gets absorbed into the substrate, with only a little of the light making its way back to the laser beam optics and camera. The process of moving through the above four stages could take a few hundred milliseconds. During this process, there is a huge variation of light that bounces back to the camera. 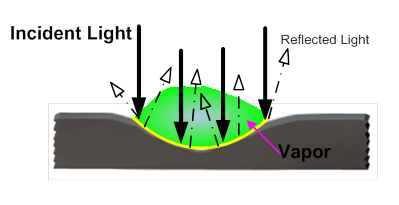 For example, the light bouncing back during the Keyhole Formation stage could be 10-15% of the light received during the initial irradiation of light right after the laser is powered on. As a result, a weld camera that has been specifically designed for the huge range of light variation such as the Xiris XVC-1000 is necessary to properly image the laser welds through the start up of the laser beam. Cameras have been integrated into laser welding and cutting machines for some time as a valuable tool for set up and alignment of the laser head to the workpiece. However, traditionally, once the laser power was turned on, the cameras were not able to see the laser light. To do this, a high dynamic range weld camera such as the Xiris XVC-1000 is required to see the enormous range of light reflected back from the substrate and deal with the huge range of brightness of laser light reflected back to the camera. Image Processing is slowly making its way into the welding world. With the advent of high dynamic range weld cameras such as the Xiris XVC-1000, images of welding processes can be made with enormous ranges of brightness. As a result, it is now possible to monitor and record good quality video of most welding processes using an HDR camera. With good quality images of the weld pool, arc and seam, the next logical step is to incorporate image processing into the camera system to extract additional information to help operators better control the welding process. The BlobAnalyzer tool from Xiris is a powerful Blob Analysis tool that can measure a variety of properties of objects within a region of interest. Data can be generated from the properties and then monitored or analyzed so that objects measured or sorted based on their shape parameters. The net result is a new way for fabricators to enhance the monitoring and controlling their weld processes. By incorporating image processing tools such as Blob Analysis into their weld camera systems, machine builders can measure features of their weld processes in a way that has never before been possible. It is now possible to find features in an image, such as the weld arc, or seam, that could allow for further monitoring or analysis, or form the foundation for seam tracking or weld pool geometry analysis.